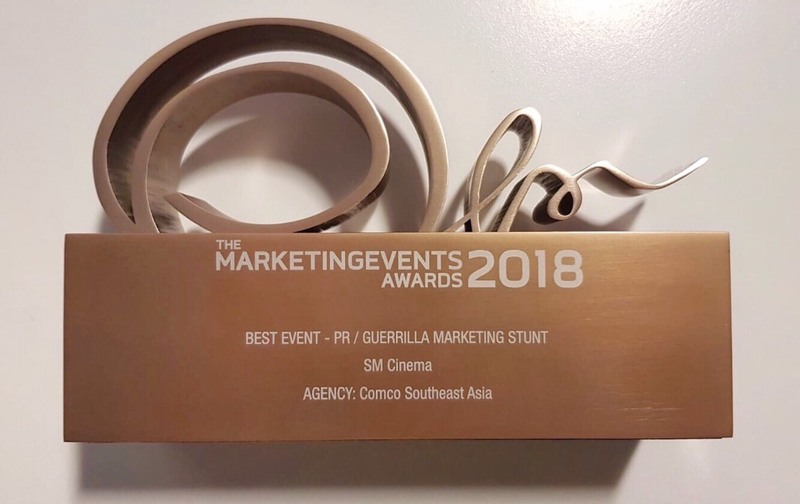 SM Cinema is the lone Philippine brand to win in the prestigious Marketing Event Awards 2018 in Singapore. The largest film exhibitor in the country bagged the Bronze Award for Best Event – PR/Guerilla Marketing Stunt. SM Cinema’s execution of the Avengers Fan Event and Deadpool as a part of its Reel to Real campaign was awarded Bronze in the Best Event – PR/Guerilla Marketing Stunt category by the international award-giving body, which recognizes the excellence in event marketing across South Asia, Southeast Asia and Australia-New Zealand regions. The winning stunt activities were SM Cinema’s treat for die hard fans for the release of the movie “Avengers: Infinity War” as well as Deadpool 2. What was supposed to just be the biggest fan gathering turned into the biggest surprise as well when Director Joe Russo and actors Benedict Cumberbatch and Karen Gillan appeared via live video on the big screen in one of the SM Cinema theaters in SM Megamall, giving excited Marvel fans the chance to interact with the people behind the movie. The event caught the attention of the Filipino audience and added more hype to the already much-anticipated film. Meanwhile for Deadpool 2, SM Cinema invited multiple cosplayers to dress up as Deadpool for a fan event at SM Aura, which included exciting activities and trivia games. Staying true to the irreverent character of Deadpool, the cosplayers were also commissioned by SM Cinema to go around SM Aura, where this very atypical movie hero started doing some very typical mallgoer things. Deadpool taking a selfie with fans, Deadpool serving popcorn at Snack Time, Deadpool chilling at the Han Solo Photo Wall and Deadpool was even caught at the screening of his very own movie at SM Cinema, thrilling fellow moviegoers! For a truly world-class cinema experience, head to the nearest SM Cinema branch to watch the latest movies. You may also book your tickets through the website, www.smcinema.com or download the SM Cinema mobile app. Just stay tuned and follow /SMCinema on Facebook and @SM_Cinema on Instagram for updates!